1. Open the lid, pour the disinfection beads into the interior, plug in the power, press "-", start to work. 2. Put in the stainless steel tools. The light will powe on / off repeatly in the process of sterilization. When the temperature is lower than 80°C, it will automatically power on. Disinfection is completed after 15 minutes. Using low-high temperature design, the disinfection work process is repeated by the temperature changing. Please do not pull the plug when it is working. 【WHY TO USE】150°C high temperature disinfection insteads of the traditional hot water disinfection, can kill more than 99.9% of stubborn bacteria and viruses. Put the glass beads into the inner pot, the intelligent sterilizer can automatically increase to 150°C when you plug in the power, which keeps the tools clean and sterile. 【HIGH QUALITY】High temperature aluminum liner material manufacturing, the liner can not be disassembled. Smart thermostat heating, high safety factor. ABS plastic outer, humanized design with nine vent holes on both sides, three vents at the bottom, safer rest assured. Will not hot your hand when you touch the outer. 【PRACTICAL USE】Convenient, eco-friendly, save energy. Best for disinfecting metal tools (prohibit plastic), such as hair tools disinfection, nail supplies tools desinfection, sterilize detal instruments, etc. 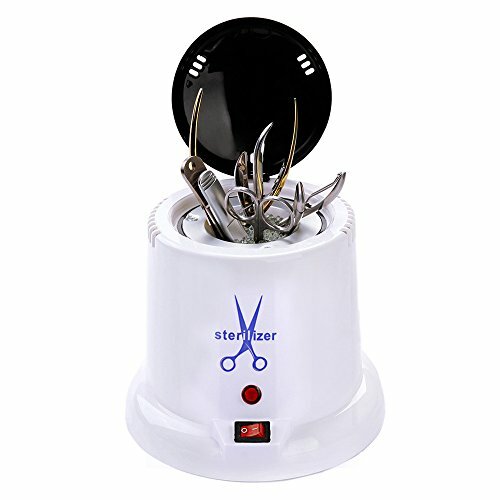 Ideal for beauty salons, spas, home, professional and personal use, bid farewell to bacteria, get a healthier life. 【PACKAGE INCLUDES】1 × stainless steel tool sterilizer machine, 1 × 140g disinfection beads. Please note that the other accessories are not included. 【COMPACT SIZE】Machine outer : 16CM*16CM ; Machine inner : 6.5CM*4.6CM. Only the glass beads can be put into the inner pot, the liquid is not allowed! But if the beads are get black, please purchase new beads, stop using the black beads.